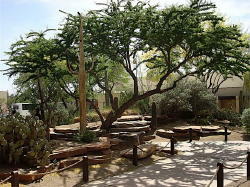 Common English Names: Twisted Acacia, Schaffner's Acacia; Common Spanish Names: Huisachillo, Huizache Chino; Scientific Name: Acacia schaffneri (ah-KAY-shuh SCHAFF-nur-aye); Family: Fabaceae (Legume Family); Geographic Range: Big Bend to southern Texas and northern Mexico south to Colima and Puebla; the West Indies and South America; Plant Form: Large multistemmed thorny shrub 15' W X 12' H, or small tree to 20' H. Remarks: Fragrant golden-yellow globular flowers in spring and occasionally thereafter; gnarled appearance with twisted branching and paired thorns; useful as a screen or barrier plant in low and warm, mid-elevation deserts; tolerates variety of soils. Chilopsis is a genus of flowering plant, containing a single species, Chilopsis linearis. 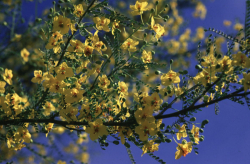 It is a small tree native to the southwestern United States and Mexico. 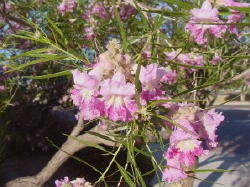 Despite the common name Desert-willow, given because of its willow-like leaves, it is actually a member of the bignonia family Bignoniaceae. It is commonly seen in washes and along riverbanks at elevations below 1500 m in its range. 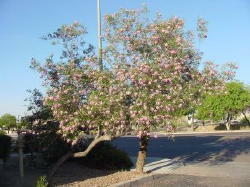 A large specimen in flowerRanging from 1.5 to as much as 8 meters in height, it can have the general appearance of either a shrub or a small tree. The linear curved leaves, ranging from 10-26 cm in length and 2-4 mm broad, are deciduous. The flowers occur in a terminal panicle or raceme; the bloom starts in May, and progresses into September, with 2-4 flowers open at any one time. The calyx is about 8-14 mm, slightly inflated, and varying shades of purple, while the corolla is 2-5 cm, and with colors ranging from lavender to light pink. The throat and lower lip has a pattern of yellow ridges and purple lines, and the margins are crinkled. It is pollinated primarily by large bees in the family Apidae, such as carpenter bees, bumblebees, Anthophora, and Centris. The fruit is a linear pod up to 35 cm long, containing numerous winged seeds. There are two subspecies: Chilopsis linearis subsp. linearis. Utah, Arizona, New Mexico, western Texas, Mexico. Chilopsis linearis subsp. arcuata. Nevada, California, Baja California. Chilopsis linearis 'Rio Salado'It is cultivated for its large showy flowers, and tolerance of hot, dry climates. Although the natural growth is a very irregular shape, it can be readily pruned into a conventional tree shape. 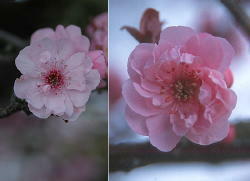 A number of cultivars have been selected, some (e.g. 'Rio Salado') with flowers of a dark and rich purple or magenta shades. Chilopsis is closely related to the genus Catalpa and hybrids can be made between the two genera. The nothogeneric hybrid between Chilopsis linearis and Catalpa bignonioides has been named �Chitalpa tashkentensis; as the name suggests, this hybrid was first raised in a botanic garden at Tashkent in Uzbekistan. It has broader leaves, up to 4 cm broad. 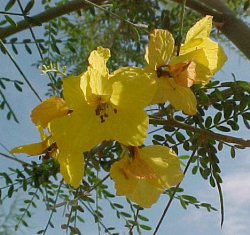 Parkinsonia aculeata is a tree from the family Fabaceae; common names include Mexican Palo Verde, Parkinsonia, Jerusalem thorn, or Jellybean tree. It is native to the southwestern United States (western Texas, southern Arizona), Mexico, the Caribbean, South America south to northern Argentina, and the Galapagos Islands. It grows from 2 to 8 meters high. The leaves and stems are hairless. 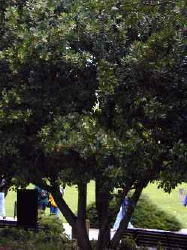 The flattened leaf stalk is edged by two rows of 25-30 tiny oval leaflets; the leaflets are soon deciduous in dry weather, leaving the green leaf stalks and branches to photosynthesize. 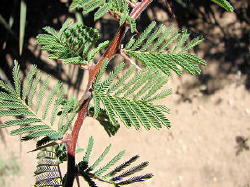 The branches grow sharp spines 7-12 mm long. 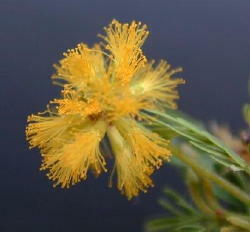 The flowers are yellow and fragrant, 20 mm in diameter, growing from a long slender stalk in groups of eight to ten. The fruit is a pod, leathery in appearance, light brown when mature. 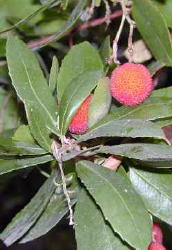 P. aculeata is a major invasive species in Australia, parts of tropical Africa, Hawaii, and other islands in the Pacific Ocean. It was introduced to Australia as an ornamental tree and for shade around 1900. It is now a serious weed widespread through Western Australia, the Northern Territory and Queensland, covering about 8,000 square kilometres of land, and has the potential to spread through most of the semi-arid to subhumid tropical area in Australia. It forms dense thickets, preventing access for humans, native animals and livestock to waterways. The seed pods float, and the plant spreads by dropping pods into water, or pods are washed dowstream by seasonal flooding. Several control methods are used to reduce the existing population and the spread of P. aculeata in Australia. Three insects have been introduced to Australia for biological control; the parkinsonia seed beetles, Penthobruchus germaini and Mimosetes ulkei, both have larvae that specifically eat the seeds from parkinsonia pods and are proving to be a useful management tool, and the parkinsonia leaf bug, Rhinacloa callicrates, which destroys photosynthetic tissues but has had no impact on the weed. Fire is effective for young trees; mechanical removal and herbicides are also used. 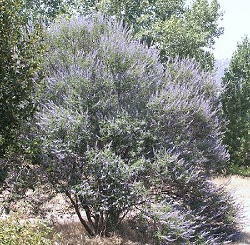 Vitex agnus-castus is widely cultivated in warm temperate and subtropical regions for its aromatic foliage and flowers. It grows to a height of 1-5 meters. It requires full sun or partial shade along with well-drained soil. Vitex, also a traditional plant in Africa, is a little-known fruit plant that has potential to improve nutrition, boost food security, foster rural development and support sustainable landcare. The leaves and tender stem growth of the upper 10 cm (4 inches), along with the flowers and ripening seeds, are harvested for medicinal purposes. 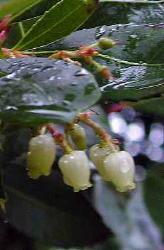 The berries are harvested by gently rubbing the berries loose from the stem. The leaves, flowers, and/or berries may be consumed as a decoction, traditional tincture, cider vinegar tincture, syrup, elixir, or simply eaten straight off the plant as a medicinal food. The berries are considered a tonic herb for both the male and female reproductive systems. The leaves are believed to have the same effect but to a lesser degree. This plant is commonly called monk's pepper because it was originally used as anti-libido medicine by monks to aid their attempts to remain celibate. It is believed to be an anaphrodisiac, hence the name chaste tree. Clinical studies have shown its beneficial effects in the management of premenstrual stress syndrome (PMS) and infertility. The use of extracts of the plant is recommended in Germany. Its mechanism of action is not well known. A study has found that treatment with higher doses of Vitex Agnus-castus caused a slight "reduction" of prolactin levels, whereas lower doses caused a slight "increase" as compared to doses of "placebo". A decrease of prolactin will influence levels of Follicle-stimulating hormone (FSH) and estrogen in women; and testosterone in men. Flavonoids, alkaloids, diterpenoids, Vitexin, Casticin and steroidal hormone precursors have been isolated from the chemical analysis of Vitex agnus-castus. It is believed that some of these compounds work on the pituitary gland which would explain its effects on hormonal levels. A study has shown that extracts of the fruit of VAC can bind to opiate receptors; this could explain why intake of VAC reduces PMS discomforts. Botanical: Olea europaea "Swan Hill"
In 1990, in an effort to combat increasingly high pollen counts in parts of the Las Vegas Valley, the Clark County Board of Health outlawed the planting of Fruitless Mulberries, and placed restrictions on which olive varieties could be sold or planted. Only the varieties Swan Hill� and Wilson are currently exempt from the restrictions. The olive planted in Las Vegas is the subtropical European Olive (Olea europaea), native to the entire Mediterranean region, and a nearly universal symbol of peace. This tree has been cultivated since the Stone Age, the first written record occurring about 5000 years ago. It was the backbone of early Western civilizations, including Ancient Greece, Rome, Carthage and Phoenicia. The olive tree produced oil for cooking and food preservation, lighting and industry, and the wood was used for a number of purposes. 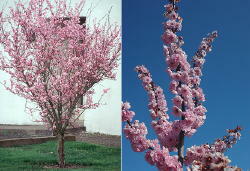 In the 1500s, the Spanish introduced the tree to Mexico, and then to California, as part of Mission plantings. The tree was not grown strictly as an ornamental until recently. It is part of a large family, including ashes, privets, jasmines and lilacs. There are approximately 10 other types of olive trees, most from Africa and Asia. Only one of these other types has been commonly grown in Las Vegas. It�s known as the Little Ollie olive, a dwarf non-fruiting variety used for hedges. 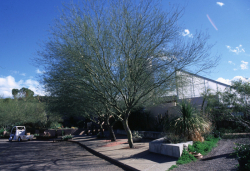 Olives became popular Las Vegas landscape specimens in the 1950s and 1960s, when the real estate boom began and the olive orchards of Southern California were being replaced with housing developments. 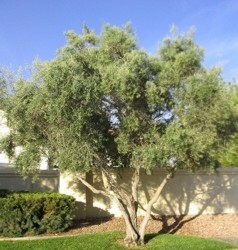 Since olives transplant well at any size, many of the California trees came to Las Vegas as full-sized landscape specimens. The tree blooms with small fragrant white flowers in April and May, and sets olives which ripen from August to November. The olives are not edible until processed professionally. Varieties said to be fruitless and pollenless have recently become available.